Well, this post is loooong over due and karma is paying me back. I've got that old Blood Sweat and Tears song, Spinning Wheel, stuck in my head. And now you can have it too. But music from the '60's is not what this post is about. It's about unexpected kindness and generosity. 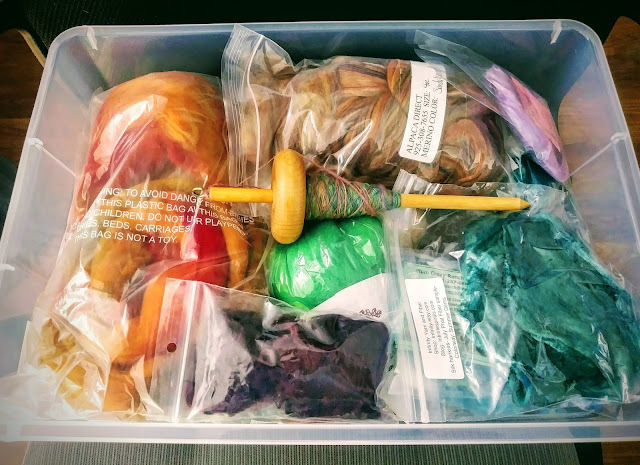 A while back, I mentioned that I wanted to learn to spin my own yarn. And a few days later, a package from Araignee's Tangled Web showed up on my door step. 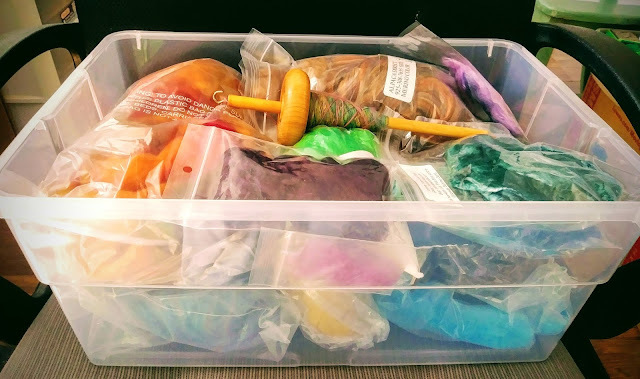 Not only did the box contain a large amount of a variety of fibers, there was also a drop spindle, a couple of Araignee's special soaps and a copy of Respect the Spindle. Apparently I'd had perfect timing when I said I wanted to learn to spin because Araignee was in the middle of a de-stash. Thank you, thank you, thank you Araignee! I'm embarrassed to admit that the box of fiber has been sitting here on my desk for almost two months untouched. In my defense, I've been frantically trying to get a few projects finished and off the needles before 'the season' started and I had to return to work. Sadly, I did not get everything finished that I'd hoped to. But give me a month or two and I will be learning to spin. Or more likely, making a giant mess while I attempt to learn to spin. I'll be sure to share my spinning adventures with you because I'm sure they will be comically horrendous. As for Araignee's soaps, I'm sort of hanging my head in shame for not using them yet. Sort of, but not really. I may not be using them in the traditional sense, but I am most definitely enjoying them. They smell so good I can't bear to add water to them. At the moment, the Mediterranean Fig bar sits on my desk and freshens up the area every afternoon when the sun comes through the window and hits the bar and the Lavender Vanilla bar rests beside my bed and sends me into sweet dream land each night. One day.... One day I'll get tired of picking them up to dust and I'll take them into the bathroom. But until then, goodness! They smell so good! Spinning wheel got to go 'round..."
I picked up my first spindle and fiber at the MDSW and it sat for two years before I worked up the courage to try it. It took me a long time to figure it out but once I did....it was the most amazing thing ever. Don't forget my soap giveaway is Sunday. If you are really sensitive like I am you should try one of the glycerin bars I am posting about today as a hand soap. They are not too pretty to use. I get that. I have favorites I can't use either. LOL over the song. Hadn't thought of that song in YEARS!!! What a wonderful package from Deb. Have fun learning. Too funny! I did not click the link. LOL. I used to grab the cologne cards for a Man's product called Noble. Oh my! I would put them in my pillow case. Such sweet dreams. Hahahaha!! I have never had the urge to learn to spin but I admire all the people who do it and love it!! Clearly your timing was perfect ... I love keeping special soaps in my lingerie drawer(s) ... and I'm not clicking ANY of those links. no need to get ANY new songs or ideas into this head of mine ;-) Happy Saturday! !